Thought I’d pop on here and show you my latest quilt (& cushion!). I’ve called it 'Break out the Bunting', because it was inspired by outdoor garden parties with bunting fluttering in the warm breeze. It plays with the humble corner block, using two different sizes of corner that cleverly fit together when rotated to create lines of triangles that look like bunting. It was a great scrap buster, I think I must have used every single bright fabric I have in my stash! I used Kona white for the background on the quilt. I quilted the quilt with an all over free motion meander design. I made a matching cushion too. But for this one I used low volume prints for the background instead of the solid white fabric. And did straight line quilting for a more modern look. Not sure which I prefer! What’s your favourite? I’ve written this up as a pattern which is available to buy here. When I was designing this one I played with lots of different layouts of the blocks, so I included all of those other layout ideas in the pattern too. Two of my lovely pattern testers, Martine and Abigail opted to make up some of the alternative designs. Martine made this wonderful Ombre version. And Abigail made this striking version of the Radiating Squares idea. 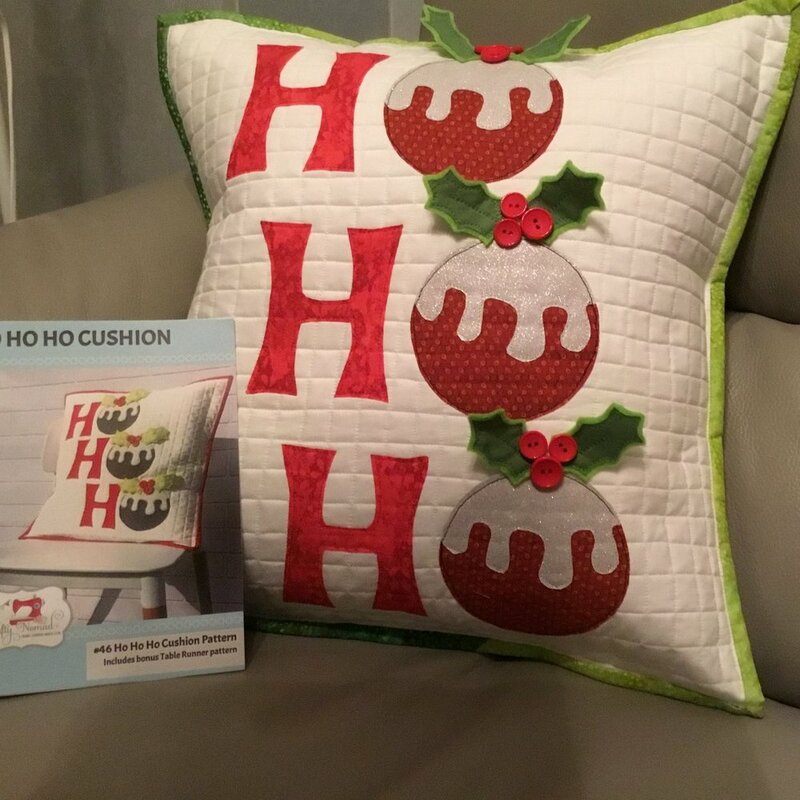 Fancy a Ho Ho Ho Cushion Sewalong? This sewalong has finished now. But do check my social media feeds or recent blog posts about other sewalongs I might be hosting! I’ve been mulling over on social media whether to run a fun, short Sewalong for the Ho Ho Ho Cushion to help encourage you all to get it made before the big day! Quite a few were keen so here you go! We’ll start on Friday 30th November and aim to be finished by the 10th December. That gives you two full weekends. Making this totally achievable! Plus it will be finished in plenty of time to look great with all your other holiday decorations! Sign up to the Ho Ho Ho Cushion Sewalong email newsletter to get the prompts. To join in you’ll need to get the Pattern which you can purchase HERE. It’s available as a PDF or as a Paper version. Come find me on social media: Facebook; & Instagram. Here are a couple of versions made up by myself and one of my customers. Really looking forward to seeing your creations!! A couple of years ago I made my Tumbling Spools quilt for Quilt Now magazine. I knew I wanted to release it as a pattern as there was a lot of interest in it. But I decided I wanted to redesign it before releasing it as a pattern. I wanted it to be smaller so it would be perfect for most people’s craft rooms. I also wanted to make it a bit more interesting!! So, say hello to the Tumbling Spools Sampler Mini Quilt. A stack of spools on the left that look like they are about to come tumbling down and some Quilty words on the right. The quilt finishes up at about 22x32 inches. I’ve made the centres of the spools into sampler blocks so each one is different. You can choose to make up the six different sampler blocks if you like. But there are also patterns where the centres are plain so you can fussy cut your favourite fabrics instead. When it comes to the words you also have a couple of options too. Quilt them in place. Or appliqué them! Templates and instructions for both. The really exciting thing about this quilt for me is that this one is going to be at Quilt Market and Quilt Festival in Houston this week!! So if you are going and want to see it in the flesh then head on over to the Sulky of America booth. I’ve used Sulky 40wt. Rayon threads as they are perfect for the quilting as they really catch the light and stand out so well. In the UK these are sold under license by Gutermann and also I think directly from Sulky. The pattern is available as an immediate download PDF on my website. So you can print at home and get started straight away! You might also be interested to know that I’m hosting a Quiltalong for this mini quilt in January! Plenty of AMAZING prizes from AMAZING sponsors!! And plenty of time to get the pattern and gather your supplies! You can sign up to a Quiltalong Newsletter so you don’t miss a thing! The quiltalong starts on the 4th January and will run for 10 weeks. Week 1 Blog Post can be found HERE. Week 2 Blog Post can be found HERE. "Ho Ho Ho Merry Christmas"
Said in my best Father Christmas voice! This is my latest pattern! November’s release had to be a Christmas design really didn’t it! It’s an applique design with 3D holly leaves to liven things up a bit. Just love the calorie free, guilt free Christmas pudding! Yum! I also made up an alternative version to show how it looks in non modern fabrics. I made this one for my sister as she loves all things vintage. We are the total opposite! Love this version too. I used floral vintage fabrics with a linen background. Little pink buttons for the berries. The pattern is available now HERE. And if you need a little nudge to get it made before the big day then I’ll be hosting a Sewalong of this pattern on my Instagram page. Would be lovely if you joined in! This is my second entry to the Blogger’s Quilt Festival, hosted by Amy from Amy’s Creative Side. I call this my Puzzled Geese Quilt. If you want to see my first entry just click here. If this is your first time here at The Crafty Nomad then Welcome! Please do take a look around. I’m a quilt pattern designer and sewing teacher based in England. My style is modern/contemporary with lots of rainbow brights. I have lots of free tutorials on the blog and lots of patterns too. I run a bi-monthly pattern subscription club (VIP Club). You may have seen some of my work in Love Patchwork & Quilting Magazine and Quilt Now Magazine. If you like what you see then feel free to sign up to my newsletter (free pattern included with the first one!). I’m active on Instagram and Facebook if you’d like to follow along there. So, as I said, the quilt I’m sharing with you today is my Puzzled Geese quilt. This is my latest pattern release. I made it using the latest fabric range from Libs Elliott, called MIxtape. The fabric line is manufactured by Windham fabrics and is fabulous quality and the colours really pop! There is a funny story behind the naming of this quilt pattern that you can read about here. I actually love the final name, far better suited than the original plan. The traditional centre block inside the large flying geese is called a Dutchman’s Puzzle. I kind of think the large geese look like they know where they are going but the little ones are a tad confused (puzzled if you like) and are flying in every direction! Hence the name: Puzzled Geese. I have stuck with simple straight line quilting on this one and I love the look it gives. Keeps it really modern looking. So today I’m joining in with Amy over at Amy’s Creative Side in her annual Blogger’s Quilt Festival. It’s a fun way to share your quilts with other bloggers and find other quilters to follow! Oh and there are some great prizes up for grabs too!! I’m going to be putting two quilts in this year. If this is your first time here at The Crafty Nomad then Welcome! Please do take a look around. I’m a quilt pattern designer and sewing teacher based in England. My style in modern/contemporary with lots of rainbow brights. I have lots of free tutorials on the blog and lots of patterns too. I run a bi-monthly pattern subscription club (VIP Club). You may have seen some of my work in Love Patchwork & Quilting Magazine and Quilt Now Magazine. If you like what you see then feel free to sign up to my newsletter (free pattern included with the first one!). So then here is the first of the two quilts I’m putting in this year. This one is my Modern Rainbow Kites Quilt. Another one of my rainbow quilts - it’s just so happy! No surprises then that I love Alison Glass fabrics. I chose to use fabric from the Diving Board range of fabrics. The quilt is foundation paper pieced. I echo straight line quilted and added a couple extra columns of ghost quilting too. I had toyed with the idea of free motion quilting inside the kites, but i quite like the way they pop up, although still not totally ruled it out! The pattern for this quilt is available as a PAPER version and as a PDF version if you are interested. My latest pattern release is the Puzzled Geese Quilt Pattern. I had some fun with the naming of this one! I was going to call it Confused Geese, that's what I've been referring to it as for the last year, since I'd first sketched it out. But as I was about to send it to the printers I just thought I'd check there wasn't one named that already. Lo and behold there were several! So back to the drawing board. After lots of brainstorming with a friend I realised Puzzled Geese would be perfect due to the central block being a Dutchman's Puzzle! I wanted something along these lines as it seems to me that whilst the large geese seemed to know where they were going, the little geese look like they have no idea lol! I'e used a vibrant fabric collection called Mixtape by Libs Elliott for Andover Fabrics. It a really fun and modern, punchy fabric collection. With a wonderful quality feel. I opted for straight line quilting which I think works really well. Especially like the bits where I omitted a line, I think it gives the project more depth. There are two size options for this design included in the pattern: Baby - 40 x 46 inches; and Large Throw - 60 x 70 inches. I've included a Foundation Pattern Piecing option for the centre block and also instructions to piece it traditionally if you prefer that technique. I've also included a small section on making scrappy binding. Non directional prints tend to work better with this design. But if you choose directional prints you just might need to purchase more fabric. I think this block would also work really well on a bag, or make up a couple of blocks and it's the perfect size for a cushion! Might have to make a cushion now! The pattern is available as a Printed Booklet (Paper) Pattern which will be delivered to you in one of my fab hot pink polka dot envelopes! Or as a PDF for immediate download if you don't want to wait for the postie! I'm super excited about my latest project!!! Being British, and I think given that for 10 years I was an expat, I have a bit of a thing for all things British! I even have a Pinterest board for it! I've made a few British themed things before, a Union Jack cushion for my sister, an appliqued telephone box phone cover, a London Bus bobbin brooch, an applique post box notebook cover, applique Union Jack t-shirt.....etc. This time I decided to make a table runner. Featuring foundation paper pieced union jacks, with relevant appliques in the centre. I was inspired by the upcoming Royal Wedding. At one point I almost added a US flag too, but then the Union flag won me over, sorry American readers, I know Meghan is American but hey ho! I've chosen fairly small ditsy prints that are non-directional as these work best. The pattern will go out to all my VIP Club members early next week and will then be available for purchase on the 10th April 2018. Plenty of time to get it made up in time for all those street parties and garden parties. Dress your table in style. It even comes with the added bonus of instructions to make up matching placemats! You can buy the pattern HERE. It's no secret that I LOVE rainbow fabrics!! So last year when I spotted this new range of fabrics coming out I knew I needed it in my life!! So I set to designing a quilt that featured it. This was turned into a commission for a magazine, that you'll see later in the year. 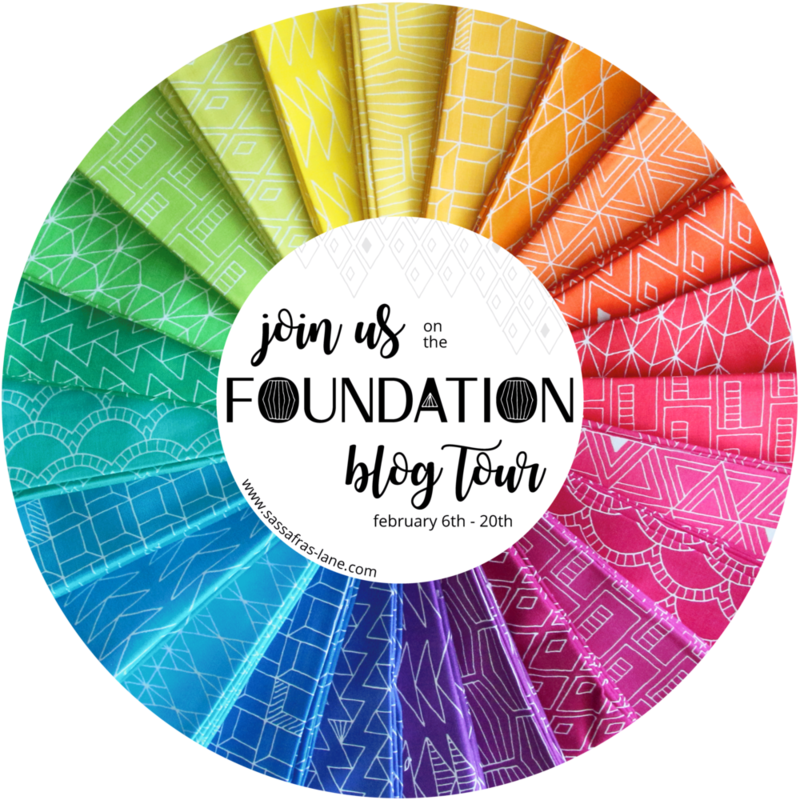 But I had a little left over and when I saw that Shayla Wolf, the designer, was going to launch the fabric with a Blog Tour I thought I'd offer to help! If you aren't familiar with Shayla's work then do head on over to her website Sassafras Lane Designs and check it out! Foundation features hand-drawn designs in vibrant colors. These bright prints will mix beautifully into a variety of projects and boldly enhance any fabric stash. The spectrum of color is balanced by several neutrals and low volume options. If you love it, make sure to ask your local fabric shop to stock it!! So on to what I made for the Blog Tour!! It's a bit of a story lol! I had heaps of ideas but narrowing it down was hard. Plus I wanted to showcase the fabric! So some of the ideas got struck off. Then one day I was reading an Instagram post of someone I met on a quilting retreat. Ruth talked about how when she set up her Instagram page to show case her creations, it was to try to create every day. Over time that has slipped away due to a busy life (we all get that, right?) and now she wants to get back to it. Her post resonated with me so much as it also talked about how much better she felt when crafting. When I used to teach, I lost count of the number of people who told me how learning to sew had helped with their emotional and mental well being! Sewing does indeed, mend the soul. So! Inspired by that post I decided I needed ANOTHER rainbow mini quilt for my wall in my sewing room (you can never have too many!) to remind me to Create Every Day! And so the Create Every Day Mini Quilt was born! It's a mix of foundation paper piecing, traditional piecing and raw edge applique! The spool is foundation paper pieced. When I designed it I was thinking about the Guterman thread that I use. They are on a skinny spool and the thread criss crosses as it is wound onto the spool. So I wanted to create something like that. I wanted the words to also feature all the fabrics I had. I did toy with doing each letter a different colour. But given that I had chosen to use a cursive font I decided this wouldn't work. Plus I wanted to mimic the graduation of colour on the spool. So I sewed strips together before making the applique and then used them in the reverse colour order. I decided to quilt it with spools and loops in between. I'll put a video tutorial onto You Tube if you are interested. I love it so much it just makes you happy looking at it lol! So I thought I'd make it into a pattern so you can make one for your sewing space too!! It can also be made into a cushion if you make the borders a bit smaller. You can get the pattern HERE. In the pattern you get the foundation paper piecing pattern, construction instructions for the mini quilt and full instructions on how to choose a font you like and make that into an applique template. 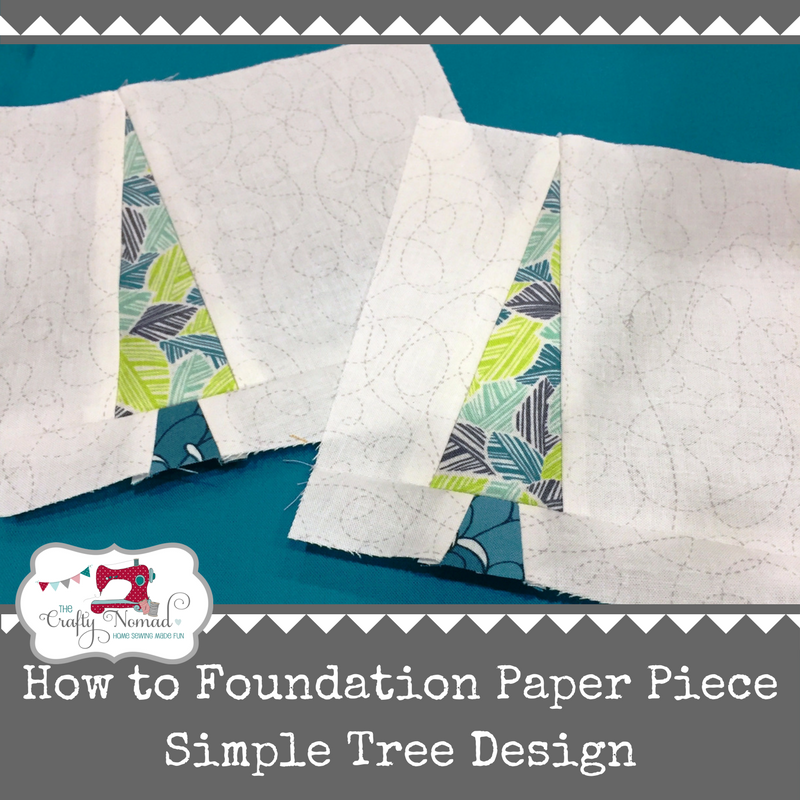 If you are new to foundation paper piecing then be sure to check out my FREE pattern and video tutorial on that. If you liked this pattern be sure to check out my blog, free tutorials and other patterns for sale. I'm the last one on the Blog Tour so if you are just joining now then please do hop through all the links below to check out what everyone else has been making. It seems I have become a very intermittent blogger! I've been so busy making, writing patterns and social media that my blogging has taken a bit of a back seat. Sooooo what that means is that we have loads to catch up on!! Let's start with my Apples and Pears Quilt Pattern. I wrote this for my November pattern release. It's got four options, 2 large and 2 small, each with one for beginners and then a more advanced option! I made the large advanced version. The only thing that makes it more advanced than beginners is that it has flying geese in it. The design is based on a set of stairs. When I was a little girl, at bed time my mum always used to say ‘up the apples and pears’, which is cockney slang for stairs. We aren’t even from London, go figure lol! Anyhow that's how it got it's name. The quilt is strip pieced, apart from the geese so it comes together quite quickly. Two more versions below show both smaller options. The grey and blue one is the simple version with no flying geese, made by Amanda. And the one on the right is with the flying geese and is made be Martine. Interested in the pattern? You can get it HERE.